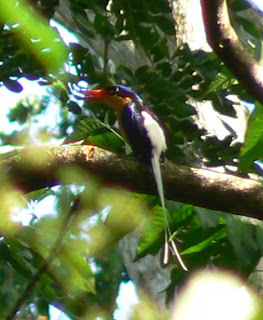 The Daintree Valley is echoing with birds - especially the fabulous Buff-breasted Paradise Kingfishers of which we have several nesting around our 30 acres. But they are sooooo hard to photograph and mostly you just catch a glimpse of their distinctive white tails as they flit through the rainforest. This is pretty blurry I'm afraid but at least you can see the beautiful colours - will keep trying for a better shot. Of course the other day I walked down the drive - without the camera - and one landed on a branch right in front of me!